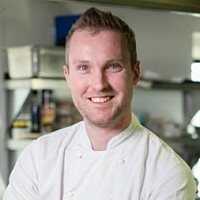 Dougie, joined The Tudor Room at Great Fosters in 2015 and gained a Michelin star a year later in 2016 and Surrey Life magazine 'Chef of the Year' in 2017. Born in Scotland, Dougie first began his career in Ayrshire before venturing to Jersey to work at Bohemia, a Michelin starred restaurant, ranked in the top 20 UK best restaurants. Four years later he left as Sous Chef and keen to progress, his next position was at Whatley Manor which held two Michelin stars. Ambition then led him to Sydney where he worked at Quay, ranked in the top 50 restaurants in the world for a year before returning to the UK to take up the position he currently holds.